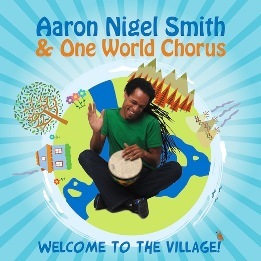 "Aaron Nigel Smith, known for his work on PBS TV and his award-winning music for children, will release Welcome to the Village!, a globe-shrinking collection of songs featuring the voices of hundreds of children from New York, Los Angeles, Portland and a school near Nairobi, Kenya. The release is the first from Aaron's non-profit One World Chorus project. Welcome to the Village! just launched on iTunes and will be available on CD September 4th from Aya World Productions. A portion of proceeds from the new release will help build a music program at the Cura Rotary Home, an orphanage and school in Kenya. Nearly a year in the making, Welcome to the Village includes 13 songs, including “Fanga Alafia,” traditional Nigerian morning greeting song, performed by children at Cura. Aaron spent time at the orphanage in February working with the children and recording this and other vocal tracks for the album. Aaron mixed these children’s angelic voices with those of kids he’s worked with at the Palisades Children’s Choir near Los Angeles, the Achievement First Academy in Brooklyn, NY, and 5th graders from Forest Hills Elementary School (near Portland, Oregon) as well as 45 children from the greater Portland area. All in all, more than 300 voices are included in the collection of songs." What we thought: One of our new favorite CDs, "Welcome to the Village!" brings smiles to A and D's faces every time we turn it on:) There are some really great songs on this CD. The kiddos always love music that features children's voices and this CD was a big hit. Song after song you can catch us singing and dancing along. "Welcome to the Village!" exposes children to different cultures with fun songs while also offering fantastic renditions of songs they may already know. ABCD Diaries gives this CD an A! For more information about the One World Chorus, visit www.oneworldchorus.org. For a glimpse of Smith’s visit to the Cura Rotary Home, visit his YouTube page. October: Los Angeles and New York City performances to be scheduled soon. Please visit http://www.aaronnigelsmith.com/AaronLive.html for updates.